You are at:Home»Demographic Data»National Data»Category: "State Level Analysis"
This tool provides policy makers, state officials, demographers, and the inquisitive viewers a report of what kind of people are moving to each state. This visualization provides a look at how many young adults live with their parents in every state. Nationally, 34.5 percent of adults 18-34 years old live with a parent. This ranges from 47.3 percent in New Jersey and 15.6 percent in North Dakota. What Percentage of the Population Lives in Rural Areas? A look at how the urban/rural divide differs throughout the country. A look at how much commute times have increased in the United States over the last 10 years. How is the percentage of people living in poverty changing over time? A look at how the number of people in the U.S. living in poverty has changed over the last 10 year. How is the percentage of people without health insurance changing over time? A look at how the percentage of people without health insurance in the United States is changing. What time do most Americans get to work? 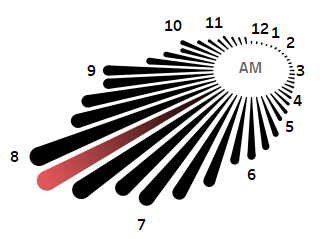 A look at what time most Americans get to work everyday. What percentage of households have a computer in each state? In 2016, an estimated 89.3% of American households have a computer. This visualization breaks down the differences by state. What is the marital status of people living in each state? A graphical look at how marital status differed in each state in 2016. How do people get to work in each state? A look at how American’s commute to work in each state.